Drag has historically been part of a nightlife subculture, but its move into the mainstream has cultivated a nontraditional crop of performers. With a sparkling gown, fake eyelashes and a snow-white wig, drag performer Lactatia saunters down the runway like a natural. But onlookers immediately notice something different about this charismatic queen: Underneath the thick makeup and glamorous ensemble, Lactatia is a 10-year-old boy. While in the audience at that first show in his hometown of Montreal, Golden said the entertainer — who happened to be “Drag Race” season six winner Bianca Del Rio — summoned him to the stage and asked him to perform. Video of that first performance, when he was just 8 years old, was posted online and went viral overnight. Soon after, Nemis Golden became Lactacia — a so-called drag kid. Drag has historically been part of a nightlife subculture relegated to gay bars and nightclubs. But with the popularity of VH1’s reality competition show, “RuPaul’s Drag Race” — which has garnered nine Emmys since its 2009 debut and has over a million weekly viewers — the art form has moved beyond big-city gay bars and into living rooms across the U.S. Nothing is more evident of this shift to the mainstream than the phenomenon of drag kids: children, typically boys, who dress up in over-the-top outfits and perform in drag. “Children naturally love color, and joy, and fantasy; but so often they are taught to ignore their natural curiosity and provided with rules and restrictions that crush their imagination,” Randy Barbato and Fenton Bailey, the producers of “RuPaul’s Drag Race,” told NBC News in a joint statement. Since Golden’s drag debut in Montreal, he has performed 12 times in Canada and the U.S. and has amassed a sizable following on Instagram. Like Nemis Golden, 13-year-old Esai — who has been performing in drag for the past four years as E! The Dragnificent — started dressing up well before officially embracing drag. “He definitely enjoys tapping into that feminine side of himself and just loves to perform, so that comes naturally,” said Esai’s mother, Andrea, who asked that her family’s surname not be published because they’ve received threats due to their son’s participation in drag. Like Jessica Golden, Andrea is very supportive of her child’s love for drag. She even started a drag kids showcase four years ago in her family’s hometown of Pittsburgh. “It’s a great artistic outlet for them,” she said of the annual event. “The makeup, the costuming, the talent, that’s nothing to sneeze at." While Esai identifies as “gender fluid,” Nemis Golden identifies as male. Jessica Golden said there are many misconceptions about drag kids — gender identity being among the most common. Perhaps the most famous drag kid is 10-year-old Desmond Is Amazing, whose real name is Desmond Napoles. With his nearly 100,000 Instagram followers, his motto of “Be yourself, always,” has inspired many other children to embrace who they are and defy real-life and online bullies. “When I do drag, I become Desmond Is Amazing, which isn't very different from who I am out of drag — just a little more fabulous,” he told NBC News at DragCon last month while donning a sparkling chandelier-like headpiece and a 1920s-inspired flapper dress. “They will never be as fierce as you and I,” he added. “Haters” are a group many drag kids — and their families — know well. While performing during the 2017 Austin International Drag Festival, Esai became the target of Alex Jones’ controversial Infowars website. 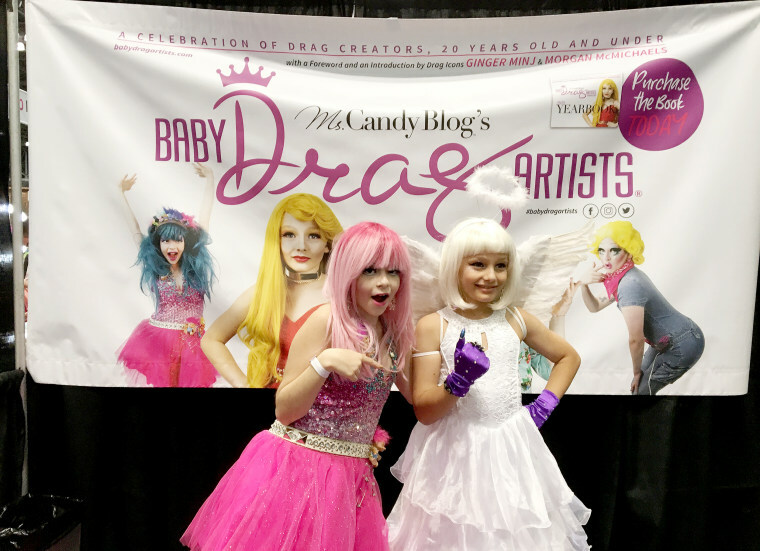 The article was titled “Drag Queen Festival in Austin Promotes Early Sexualization of Children/Gender Confusion” and claimed children were “being indoctrinated into fetish lifestyles” at the event. Andrea said she wants to “run and cry and hold [Esai] tight” in order to “deflect all the hate,” but she realizes that’s not always possible. “You always want to protect your kids, but at some point, you have to let your kids protect themselves,” Andrea added. Esai has developed thick skin when it comes to his critics — both young and old. "There’s nothing politically correct about this new frontier; it’s abuse, merely distorted and cloaked in progressivism," the op-ed’s author stated. Both Jessica Golden and Wendy Napoles, Desmond’s mom, said their approach to critics is simple: don’t engage. “DRAG RACE JUNIOR” ON HORIZON? With the debut of “Dancing With the Stars: Junior” this past Sunday and “MasterChef Junior” back in 2013, could a “RuPaul’s Drag Race Junior” be on the horizon? “This is absolutely something we have been discussing, so stay tuned,” Barbato and Bailey told NBC News.